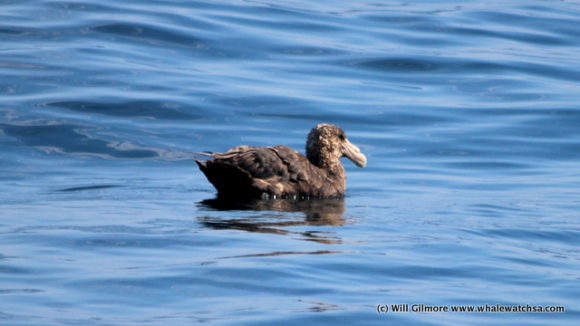 A beautiful day at sea in completely perfect conditions, with little wind and almost no swell. Our first sighting came from the shark cage diving vessel, a small bronze whaler shark came up from the depths tried to get a hold of the juicy fish heads on the bait line. These sharks are most commonly associated with the sardine run, often seen in large groups following bait balls. The name “bronze whaler” comes from the days of whaling, as they would often follow the whaling boats and be fed scraps from the boats, while bronze, comes from their complexion. 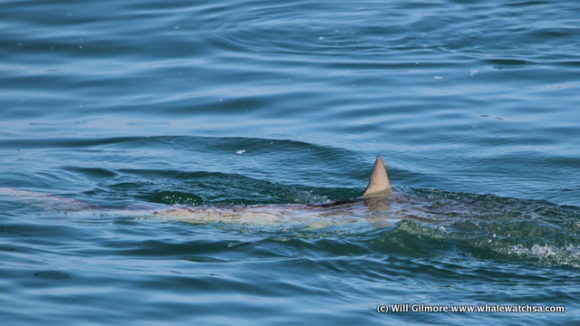 We soon had to move on as the shark boats had been slightly slow with their sightings. 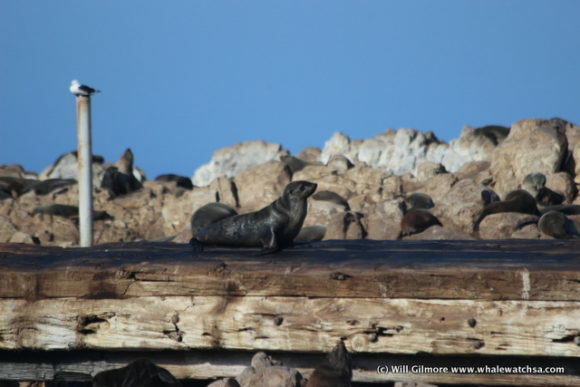 Our next stop was at Dyer Island with the hopes of pointing out some penguins. 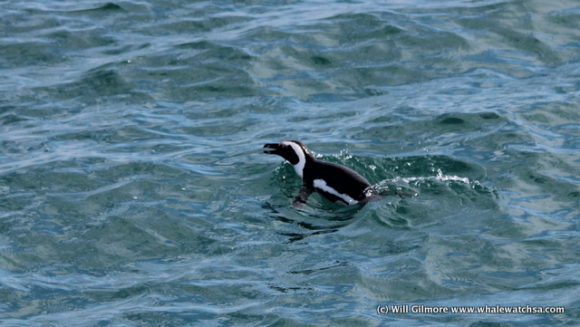 The penguins have been quite hard to see recently and are most often pointed quite far back. On a long lens, we could see a few penguins gathering around some boulders, we even managed to photograph a couple of chicks still in their brown downy feathers. 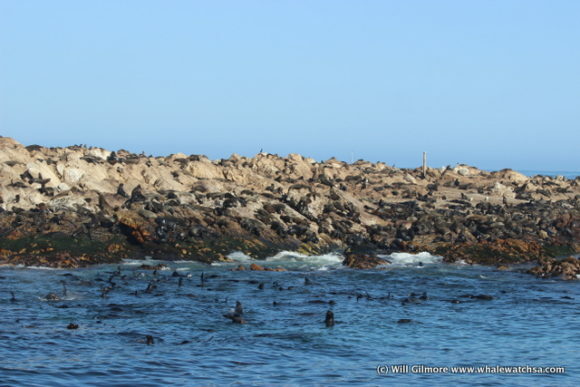 After pointing out the penguins, we headed into the world-famous waters of shark alley to say G’day to 60,000 strong cape fur seal colony, the fourth largest in Southern Africa. 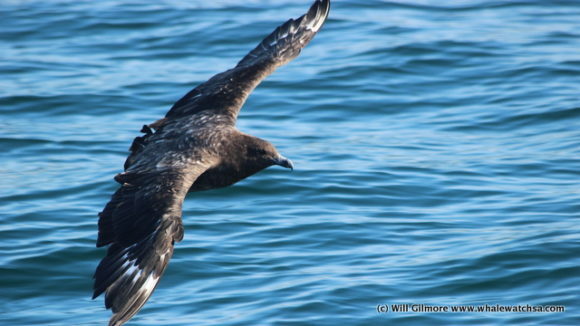 As we journeyed behind the island in search of whale spouts, we came across many pelagic birds, corey’s and sooty shearwaters, and even the beautiful cape gannet. Unfortunately, due to some technical difficulties, we had switch vessels to continue the tour. 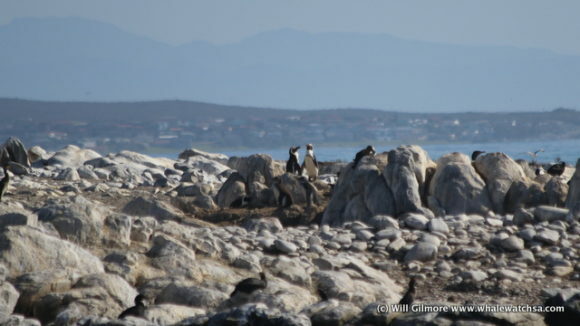 The next sighting was two adult African penguins that were very relaxed around us and in the distance, was a giant flock of cape cormorants. 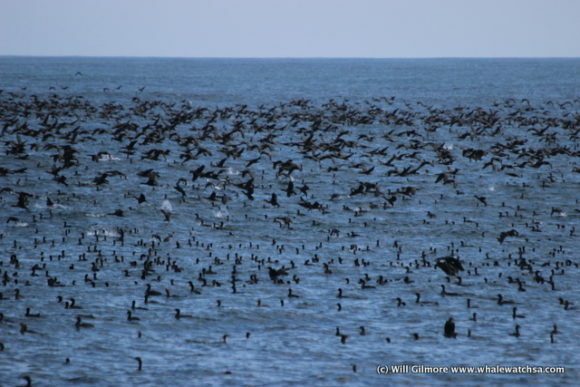 These birds are the most abundant in the area, with 60% of the population of Dyer Island. This was our last sighting of the day as we headed towards danger point and then back to the harbour.